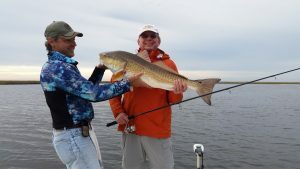 Here we are in the middle of July and the speckled trout bite is as good as it normally is in April. 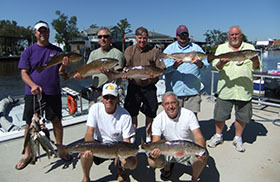 We are still catching some beautiful fish on the oyster reefs near the barrier islands. For a few weeks, the water had a nasty stain to it but for some reason this week the water cleaned up and the fish are feeding like crazy. I think the Mississippi river had something to do with the clarity of the water. The river has dropped a little and is still dropping and the water is cleaning up quite a bit. I know one thing for sure is that it has made a difference in the amount of trout we are catching verses a few weeks ago. I sometime wonder how can the bite still be on this strong with the water temperature getting around ninety degrees. 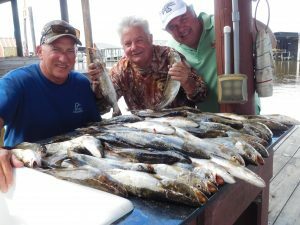 Historically specking by this time of the summer the speckled trout have moved out to the gulf where the water depth is around twenty-five to thirty feet and the water is much cooler down deeper. They seem to do the same thing every summer. 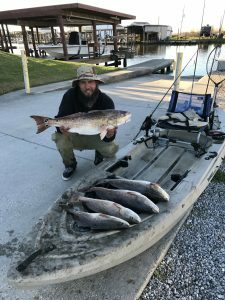 Of course, once the water temperature begins to cool off sometime in the latter part of September the speckled trout will begin to show back up on the oyster reefs in about four feet of water. I always find it amazing how the same thing happens every summer with these trout. For some reason this year the trout are staying in the shallow waters a lot longer than in the past. Funny how when you think you have mother nature figured out she will show you a side that you have never seen before. I suppose that is why the old timers called it fishing and not catching. Think about it if we caught a box of fish every time we left the camp and it was a sure thing we really would not be as excited as we are now not knowing what we will find when we arrive out there at the first spot we go to. I can describe the feeling I get every time I am crossing Barataria Bay with a group of clients, thinking about where I am going to make the first stop. Every morning is different in terms of the direction of the wind, tide direction, clarity of the water, as well as many other conditions when you arrive at the fishing spot. Always remember to consider where the sun is coming up because don’t want to be looking straight into the glare when your cork hit the water because it makes it hard to see when you get a bite. Another tip is, you never want to park your boat upstream of where you are fishing. 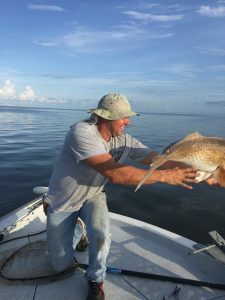 The tide will have to pass your boat to get to where the fish are and that will deflect the bait feed that is naturally flowing to the feeding area. Finally, you never want to park your boat is such a way that you are trying to throw into the wind. Always try and park your boat so that you are throwing with the wind or at least throwing across a side wind. It is so important that your cork lands as far away from the boat as possible. Remember you are fishing in only four to five feet of water. You will most likely be fishing out of a boat that is at least twenty feet long. 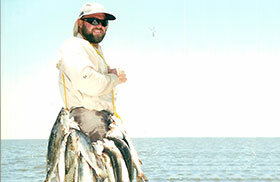 To the speckled trout and red fish below in that shallow water your boat looks like the titanic. Another good tip is to always look for the birds when traveling from one fishing spot to another. I know most people will tell you that small trout are always under the birds, however this year for some reason we have been finding some larger trout working the birds. Mother nature will always be changing from one year to the next so try and not get too set in your ways when it comes to your fishing habits. Keep an open mind and don’t be afraid to try new things while on the water. Remember a rich man goes fishing when the conditions are good and a poor man goes fishing when he gets a day off from work. 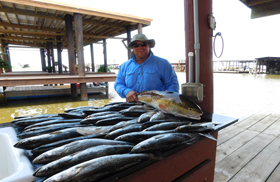 It doesn’t have to be a perfect day for you to catch a nice box of fish. A good friend of mind always says, if you don’t go you don’t know. 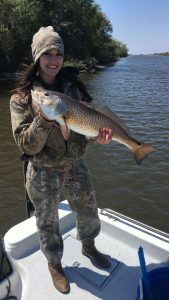 Fishing this time of the year normally is very calm in the morning so don’t be afraid to venture out towards the barrier islands. There is a lot to see and the wife and kids will enjoy the ride. I always wright about building memories by spending time on the water with your family. Most people don’t realize that it doesn’t matter to your kids if you get on a strong bite or not. It is the fact that they are out there and seeing things for the first time that they will remember for the rest of their lives. Most of my childhood memories with my mom and dad on the water was all the things that happen around catching fish. I remember my dad showing me how to set the anchor and my mom showing me how to throw a fishing pole. 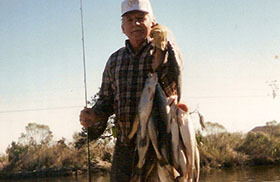 There are so many things to learn about how to become a good fisherman that it is not that important to catch a box of fish if you are taking kids with you on the water. In fact, it is to your benefit not to get into a strong bite until you children know how to handle catching fish on after the other. As you well know it can be very confusing on a boat when you are pulling them in four at the time. If you are not a well-seasoned angler the boat can get in a mess real quick if everyone doesn’t know what they are doing.